And join in the song. In The Last Chance Saloon. 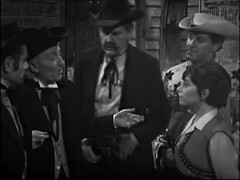 The Tardis arrives in Tombstone Arizona with the Doctor seeking a dentist. Found by the sheriff, Wyatt Earp, the Doctor passes them off as a group of travelling players. He finds Doc Holliday, newly arrived in town and recently set up shop, who's being pursued by Seth Harper and the three Clanton brothers who want revenge for Doc Holliday killing their brother. 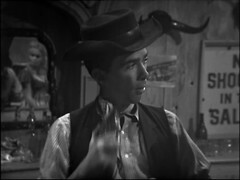 Harper,who has never seen Holliday before, mistakes the Doctor for him and lures him to the Saloon where they've forced Dodo to play piano and Steven to sing for them. 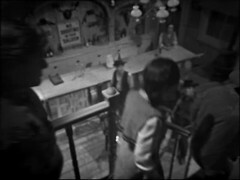 The Doctor unwittingly wanders towards the gunmen lying in wait inside the saloon. Another historical comedy story, once again from the pen of Donald Cotton who wrote the Myth Makers. 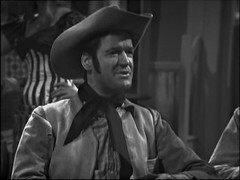 I watch the episode and smile, as the whole regular cast look like they're having a great time dressing up as cowboys, with Peter Purves once again giving an airing to the American accent he used for Morton Dill in The Chase and Hartnell, once again, obviously rising to the comedy which he does so well! There's a couple of nice aerial shots of the interior of the Last Chance Saloon which help give the area a sense of space. MASTERSON: Who're your friends, Wyatt? 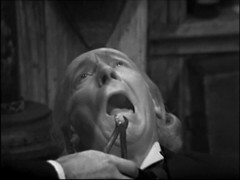 DOCTOR: Oh, quite, quite so. Allow me, sir, to introduce Miss Dodo Dupont, wizard of the ivory keys, and er Steven Regret, tenor. And lastly sir, your humble servant Doctor Caligari. His companions are less impressed with his choice. STEVEN: Look I don't know why you wanted to say it in the first place. Steven Regret? What kind of a name's that for a singer anyway? DOCTOR: Oh, my dear young man, can't you sing a little? STEVEN: Well yes, a little, but why say it at all? DOCTOR: Well, I had to find some sort of suitable cover. After all, you can't walk into the middle of a Western town and say that you've come from outer space. Good gracious me, we'd all be arrested on a vagrancy charge. DOCTOR: What? Yes, yes, what is it? DOCTOR: Holliday? Yes, I suppose so. Yes, you could call it that. HARPER: My name's Harper, Seth Harper. DOCTOR: Oh, well, I'm very glad to know you Mister Harper. Yes, I suppose you've brought a message from my friends. HARPER: Well, a kind of a message, Doc. The boys are waitin' for you at the saloon. They'd sure like to buy you a drink. DOCTOR: Oh, well, that's very sociable of them, but unfortunately I don't touch alcohol. HARPER: That's not what I heard, Doc, but we'll play it your way. HARPER: Look, we'll give you five minutes, and if you ain't there we'll come looking for you, okay? The Doctor thinking he's talking about having a Holliday of sorts while Harper thinks he's Doc Holliday! 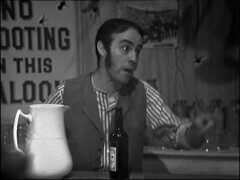 Charlie the Barman is, at last, an in front of the camera appearance for David Graham who has voiced many of the Daleks before now. Curiously the cast also features Shane Rimmer, as Seth Harper. Both Graham and Rimmer will later find fame in Thunderbirds as Brains and Scott Tracy respectively. You'll have seen Shane Rimmer in front of the camera in many other places including UFO, Space 1999, The Spy Who Loved Me, Superman II and Batman Begins. I recall watching Batman back and loving it, then up pops Shane Rimmer as the monorail controller! A few years back Liz had Superman II on recently and even over a crying four year old I recognised that voice! He's allegedly in Star Wars but I'd never clocked that the character he plays was him! 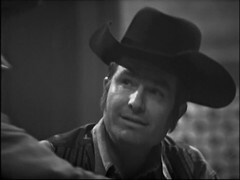 After David Graham the member of the cast with the largest connection to Doctor Who is Richard Beale who plays Bat Masterson. He'd already been the voice of the Refusian in The Ark episodes 3 & 4: The Return & The Bomb. 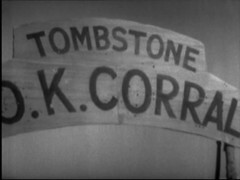 He returns as the voice of the Broadcaster in The Macra Terror and The Minister of Ecology in The Green Death episode three. 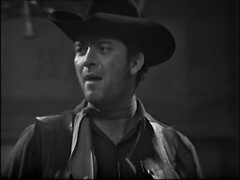 He's also got a Blake's 7 appearance to his name as Saymon in The Web. His fellow lawman Marshal Wyatt Earp is played by who I've seen in The Biderbecke Tapes as Tracy. David Cole is Billy Clanton. He'll return to Doctor Who in Full Circle Part Two as an uncredited Citizen. William Hurndell is Ike Clanton and you can hear him interviewed on Toby Hadoke's Who's Round #73. 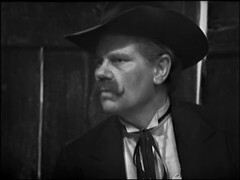 For completeness the final brother Phineas Clanton is played by Maurice Good. Sheena Marshe plays Doc Holliday's lady friend Kate. She's got an appearance in The Prisoner episode The Girl Who Was Death as The Barmaid to her name. Now if you've been reading the bits of the blog that have looked at extras you'll have spotted that The War Machines and The Silurians keep popping up on CVs from around this time some I'm inclined to say that the Silurians credit is for Doye. The Greeks in Four to Doomsday are either older bearded men or warriors in helmets with masks so we can't be sure there! 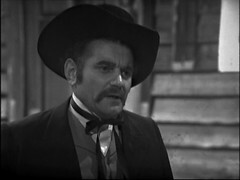 John Caesar meanwhile has been in Doctor Who before: he was an uncredited Egyptian Warrior in Dalek Masterplan 9: The Golden Death and credited as Monoid Four in The Ark part 4 The Bomb. After this he's a guard in all four episodes of The Macra Terror, uncredited for the first three but credited for the fourth, a Pirate Guard (episode 1) and a Pirate (episodes 3 & 4) in The Space Pirates (all uncredited), followed by two credited roles in the Pertwee era: C.P.O. Myers in The Sea Devils episode six and the R / T Soldier in Invasion of the Dinosaurs part one.